Carry these five items in your home for all your cleaning needs. I mix and match these items depending on what I’m cleaning and want to accomplish. Not only are all these products biodegradable, they will not clog your home’s mojo with chemicals AND you will not have to watch chemicals go down the drain into your watershed. Doesn’t that feel good? A lot of my experiences with homemade cleaners were a direct result of spending time at a couple Zen Centers in California, Green Gulch and Tassajara. It was the daily use of these cleaners in the context of a fairly high-use and bustling center that I began to enjoy the smell of vinegar and the lemon fresh oil. My body responded positively to these smells and it comforted my mind to know that everything was non-toxic. Ultimately, I learned at these centers that there is an art to cleaning and giving love to the spaces we inhabit. Dr. Bronner’s Liquid Soap – A castile soap is made using only vegetable oils (as opposed to most soaps which render from animal fat). So not only is it a guaranteed cruelty-free product, but it’s much easier on the environment as well. Castile soap is a superior gentle cleanser, and quickly biodegrades. 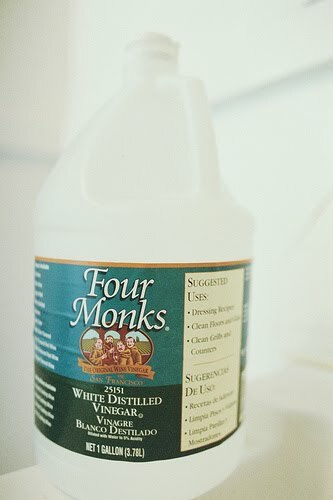 White Vinegar — Vinegar is simply acetic acid: diluted, mild, and edible, but acid nonetheless. As such, it will dissolve dirt, mildew, mineral build-up, and soap scum. Vinegar is something of a wonder cleanser, as it also kills bacteria (do not need to rinse or wipe off vinegar, let it sit and do its magic). You will need to dilute the vinegar 1:10 roughly for surface cleaning. Baking Soda — Baking soda is another amazing all-purpose cleaner, but it’s also an excellent deodorizer and scourer. As well, it softens water and helps to maintain neutral pH so that detergent can work more efficiently. It keeps your colored clothes from fading and also gets whites brighter. Borax — Borax is awesome! It’s a natural stain remover and an excellent alternative to bleach, because it’s an anti-fungal/anti-mold and all-around disinfectant. Coupled with regular soap, it greatly increases cleaning power. Olive Oil and Lemon Juice – Rehydrates and protects wood while the lemon juice kills bacteria. Use soft cotton cloth and make sure cloth absorbs evenly before using on wood. A great website for more specific ways to use these ingredients (and some other homemade household cleaners) is this one, non-toxic home care.